Continuing the ongoing trend of "now you see it, now you don't" marketing, a newly bundled edition of Gears of War 1 and 2 briefly appeared on the Gamestop website over the holidays. Titled "Gears of War Ultimate," the bundle features Gears 1 and 2 for $29.99. A digital copy of Gears 2 alone was priced at $29.99 on Xbox LIVE Games on Demand just a few months ago. If you bought it then, sorry, suckers. The bundle will be available on February 15th or 16th, there are conflicting reports. 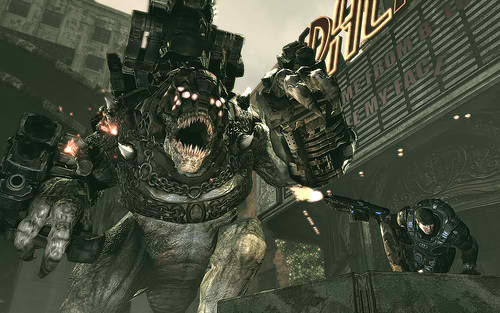 Microsoft confirmed the existence of the bundle to IGN, but added it will "not involve Gears of War 3 or the beta." There is no word as to whether these games will include the available DLC. If they don't, I will conclude that these guys don't know what 'ultimate' means. We can be certain that Epic and Microsoft will be pushing the Gears brand hard in anticipation of the upcoming fall release of Gears of War 3.